How does a one-off Oscar, The Terrytoons-Van Beuren Facebook Page, the retro re-casting of Mickey Mouse, Tom Terrific, Nudnik, Viacom, Farmer Al Falfa, Charles Lindbergh, YouTube, animation historians, Weston Woods, all mesh? I can’t help but notice the flood of comments about ancient “Terry” Toons that have been filling my email inbox in recent weeks. Only a smattering of it refers to my own extremely short-lived attempt at a Terrytoons turn-around. Most of the Terrytoon fan Facebook comments are taking seriously what I always felt to be the weakest output of any of the major American cartoon studios. On the Terrytoons-Van Beuren page, the old Terrytoons rate fanhood. Was I misguided in my attempt to reject them? Was I dead wrong, trying to turn the Terrytoons studio into a UPA clone? It appears so. My insertion at Terrytoons quickly showed me that there were talented and experienced professional animators and craftsmen there, including Phil Scheib – the phenomenal but hog-tied composer. Why hadn’t they done better? I soon saw who were the villains. I realized that it was the leadership of the studio, especially Paul Terry himself who held back the artists from doing their best. The old Terrytoons had some good ideas, even if the finish and finesse wasn’t often there. When I met Paul Terry and Bill Weiss, I saw why that was. I couldn’t quickly change the conditions that ruled the work. In the inevitable churn of changing times and interests, even my own Terrytoons films, now rarely seen, are by now already considered retro. That’s natural. The first thing I could do there was in story and an attempt at fresh characters. I realize that my thinking was definitely not old-time Terrytoons! I still haven’t shed my fascination with the new and eccentric, but somewhere there must be a bedrock of character comedy and statement, however diverse and bizarre are the coatings. What I was up against made It an exciting attempt at swimming against the tide. I’m now in a late life mode, where I cannot continue to challenge the current animation norms, or risk financially scary experiments. I’m left only with my past. I’m into examining what I did right and where I went wrong; trying to figure out where I stand, or if I matter at all in the long saga of movie animation. It’s absolutely clear that I disastrously stumbled in my hot-blooded eagerness to change the world of major-league animation flickers. My only clear success was in the minor-league kiddie film productions for schools and libraries. I was never able to duplicate my earlier 50-minutes of fame in the big-time arena of movie and TV production. All of the attention I am now receiving is tied to those six-or-seven shining years at UPA, CBS-Terrytoons, and Rembrandt Films in Prague. The following 40 years, pioneering a higher level of meaningful and entertaining children’s films with Weston Woods, was a satisfying success. Nearly all were prize-winners that made me financially secure, but are of near zero interest in the world of movie animation fans. It’s not only the meaning of my own career that puzzles me, but the seemingly unquenchable fascination, not with the obvious early classics we all learned from, but with the crudest, most naïve, cartoons, made in an animation sweatshop, and mainly for the bucks. “Bad” seems to be fun these days, but even as parody, where does that stuff lead us? Is it because we are in economic Hard Times once again, and we sense the connection with junk? Is cynicism “in” because we feel our present culture meaningless, and yearn to return to a simple-minded world? But we can’t rewind time. Our planet is now densely crowded, and we can’t live without the technology we’ve created. What should we animators be doing with it? I referred to Charles Lindbergh… When I first was brought into Terrytoons, Paul Terry invited me to lunch, claiming to guide me in my new endeavor. He told me that the key to my success would be to create a character in the spirit of Charles Lindbergh, “the greatest hero in modern American history!” That was 1956, when most Americans had either totally forgotten Lindbergh, or despised him as a Hitler Nazi supporter, a confirmed racist and right-wing political propagandist. I thought Terry was a doddering period piece, and I thought his cartoon output was crudely made crud. I realize now that I actually avoided looking at them. In the UPA mantra, they were not worth looking at. I heard mind-numbing stories from the staff about Terry’s policy of deliberate low quality. Even now, as perhaps a doddering period piece myself, I am discombobulated by this apparent adoration of Terry’s early output! I was young, and assured. I ignored Terry’s advice, and madly raced down a path that no Terrytooner had trod before! I won the adoration of many animation journalists, and I lost my job. I had watched and learned from the masterful pioneer Animators. What I’m referring to here is the mysterious trend of admiration for the junky; the kicks from deliberately watching junk, specifically the output of a man who actually seemed to revel in his junkiness! He told me so personally, even as he shifted gears, preaching to me the role model Lindberg! The vastly slicker Walt Disney was also a political and cultural throwback, but he was at least a dedicated craftsman, who if nothing else greatly advanced animation as a craft. Not so Paul Terry! After the Prague studio folded, I devolved into a personal recycler, a seeker of the overgrown path for animation to travel on. Are we now on the right path? Do zillions of Twitter one liners, gaglines, smarty retorts, lead us anywhere? Maybe they do. I’m into it myself, just having fun. But I wish I still had a chance to do something truly decent! P.S. Every one should “Like” Gene’s Nudnik Facebook page, check out Gene’s websites, and buy the Nudnik DVD and book. Gene, here is another fan – I was born literally the weekend before Captain Kangaroo debuted on CBS and Tom Terrific and Manfred were among my earliest TV memories. Now, seeing then with 50+ years of context, I am amazed at how you and your team made these simple black-and-white squiggles so dynamic! No “limited animation” with moving mouths on static bodies there! No wonder they were so memorable! And I met you in late-1984 at a LA County Museum Animation Festival where I happened to be sitting one row behind you in the audience when you got up and took a bow. My then-girlfriend insisted I get your autograph so I meekly handed you my program and a pen and you rewarded me with a signature AND a solidly on-model sketch of Tom Terrific himself. I was so delighted (and heartbroken when the girlfriend got custody of it when we broke up). I was also delighted to hear you were still around and active when you got the VIP treatment at SDCC (and more sorry than usual to miss that big shindig) and happy to see your essay here. Keep your chin up, you are not forgotten and I’m seeing more of your influence in new toons. Women can sometimes be a problem, Craig! Post your address, and i’ll make you a new drawing! Tom Terrific has had a place in my heart since I was knee-high to the channel knob. Gene, some percentage of the love for Terry and Van Beuren is nostalgia. Baby Boomers grew up watching these cartoons on TV, so they remind people of their childhoods. Some percentage of the love is that the cartoons are off the beaten track and not as available as Disney or Warner Bros. cartoons. Once fans have gone through the accessible stuff, they start looking in the nooks and crannies for their kicks. And yes, there is a fascination for the bad or the strange, simply because it defies the norms of the time. The fans are not always looking in the right place and while the fans are vocal, they are not always the majority. There’s no way to measure how much pleasure or inspiration you brought to children through your Weston Woods films because there’s no organized Weston Woods fandom, but that doesn’t devalue your work there. And as you know from your love of jazz, fashions change. What’s valued one day is disdained the next and work that was ignored is often rediscovered. As someone whose own animation career is now in the past and is something of a disappointment, I envy you for the number of films you were able to make. As I created a single TV series, I’m sure that there are animation professionals who envy me. We can ponder our own careers and the public’s appreciation or lack of it, but we’ll never figure it out. There’s no absolute standard to measure ourselves against. Ultimately, our careers are what they are and we’ve got to take whatever satisfaction from them that we can. But I think that public or fan acclaim is not the only valid standard. Terry’s bottom-of-the-barrel approach is well known, but I think one reason people continue to like old Terrytoons is that Terry’s staff did not share that attitude. They wanted to do better, and managed to bring a little more to their cartoons than Terry cared about. But even the veterans were worn down over time. The animation in Terrytoons of the 1940s is noticeably better than in the 1950s. You brought a breath of life to a dying studio, and the first real influx of talent it had seen in ages. I wonder, if Paul Terry had not been able to sell, if he would have just closed the studio completely when he decided to retire. Perhaps CBS would have let you work more in television, but I doubt they would have tried a feature film until the 1980s, when Disney began making hit features again and animation seemed more like a viable medium. I think you could have made some very interesting features, but there wasn’t a lot of interest in them for a long time. I don’t think it’s the economy that has turned people to old cartoons, or not entirely. It’s technology. We can see, to a limited extent, what we missed. We’re not limited by what some network censor has decided is appropriate to air. There are still limits to what’s available, but the number of films available is greater than ever. And we crave more. And you make a good point about the trend of animated films moving closer to reality. That’s another reason why people enjoy old Terrytoons, Van Beurens and so on. To find “cartoony” cartoons, the old ones are best. As much as I enjoy computer animation, it is not a replacement for other styles. I hope with time some studio moguls will realize that and bring back other styles. And you have seen history happen in Prague. In the years when animation was finding new ways to hit bottom back in the US, and slowly regaining its audience, you were working steadily. Going off of what Mark Mayerson said, I was mentioning to some friends the other night how the Terrytoons were the only theatricals I never saw on TV as a kid. When I began VHS tape trading with other collectors, I was really curious to see how bad these allegedly were. I still have my reservations about the studio (probably all the same as yours), but when I first started seeing them, I didn’t think they lived up to their reviled reputation – and I still don’t. Maybe 50 years of TV dreck blinds us and we fall under the spell of Terrytoons. And you’ve also got to at least see them as interesting from a historical perspective – the place where Bill Tytla was born and died, where Jim Tyer shattered the laws of physics, the fact that they were literally stuck in a vacuum, etc. All that said, rest assured there’s legions of people who love your work, Mr. Deitch. I’m sure anyone could come up with a few dozen favorite Mightys, H&Js, and Dingbat cartoons and that’s fine on their own terms. It is only your films at Terry’s, sir, that can justifiably stand on the pillars of great postwar short animation. Being in the company of the best work of Jones, Hubley, and Kimball is not too shabby a place in animation history. Gene, I’ve always found it odd that in connection to the CinemaScape Terrytoons, before you arrived Paul Terry seemed to be doing everything not to take advantage of Fox’s widescreen formula, from not using any of their established characters in the CinemaScope shorts to keeping all of the action within the boundaries of the existing Academy ratio. They weren’t even trying (or weren’t allowed to try) to take advantage of the added screen space available compared to the work you did after taking over the studio (and from a content standpoint, I still think “It’s A Living” is one of the best satires ever on TV commercial marketing, and 56 more years of advertising since it came out hasn’t changed that fact). The sad truth is neither I could fully use that CinemaScopoe space. We were required to confine all key action and lettering within the classic format, because all the Terrytoons were ultimately aimed for the TV screens of that time. No one in the 1950s or 60s knew that one day TV screens would nearly match the widescreen movies! The worst case for me was the making of the Juggler of Our Lady,” I had to seriously compromise what I had planned. “Juggler” was BORN for CinemaScope! “The sad truth is neither I could fully use that CinemaScopoe space. We were required to confine all key action and lettering within the classic format, because all the Terrytoons were ultimately aimed for the TV screens of that time. No one in the 1950s or 60s knew that one day TV screens would nearly match the widescreen movies! The worst case for me was the making of the Juggler of Our Lady,” I had to seriously compromise what I had planned. “Juggler” was BORN for CinemaScope! No doubt TV ruins a lot of things out of concern for the limited capabilities of the day. It’s weird not to think back to those days when you really couldn’t get that full experience at home when a movie made in that format had to go through the Pan & Scan treatment like always. No, we had to wait decades before the technology catch up with it in order so we could view movies as they were intended to be seen that way. Gene:I’m another one of your fans and I also enjoyed Tom Terriffic and Mighty Manfred,the Wonder Dog,along with other assorted Terrytoons.I even liked your take on Tom and Jerry! I’ll bet if you and the crew you had at the time,had more of an opportunity,you could have done much better with T and J.It sounds to me like it was MGM who didn’t give you much of a chance to do the characters justice! As talented as you are,it’s totally unfair for some to judge on the T and J toons you and your crew did. I’ll always be a fan! No! No! I don’t sell short my Weston Woods films. I feel they are among my best work. I’ve had many fan letters from teachers and librarians, but of course they don’t cross over into fanhood for movie cartoons or TV series. It only disappoints me that nearly all animation writers concentrate only on what I did 50 years ago. Only librarians, teachers, and of course kiddies, like my kiddie films! I too also love your WW productions as well. I do wish they were giving more recognition than they deserve. You certainly did a wonderful job on those adaptations without having to divert from the intended stories contained. I think mostly of the 1980’s when we had all those “video storybook” cassettes with their limited animation (or simply panning the camera around the artwork) and a lot of needless dialogue/interaction just so they could come up with something ‘original’ to lengthen the running time of those tales. Your work for Weston Woods never went down this path thankfully and stayed true to their books with the adequate animation quality and execution. Gene — add me to the fan list. Heck, I even like your Tom & Jerrys; clearly better than Jones’. You made your mark more than a few times, and can be justifiably proud. Thanks for this great article. Even if it is grim reminder that art needs funding. And too often the financiers want to put their misguided stamp on it. I have to agree. Your Tom and Jerrys, bizarre they may be, were still better than just going through the typical motions. They were off-center and entertaining in the way the best cult classics are, and I love ’em. And bear in mind, I’m a 14-year-old boy, not another T&J fan. Another fan, Gene. I read your “How to Succeed in Animation” eBook when I was still in middle school and being immersed in your experience and what you had to go through to get where you are. As someone whose cartoon career (if one can call it that) is just starting, I can only hope that I will be able to make an impact the way you did. I remember meeting you in LA few years back. What a wonderful day that was! You did great work at Terrytoons, and found a couple of inspired staff members–Jim Tyer in particular–to aid your cause. Those of us who like the older Terrytoons are charmed by their naivete, their frozen-in-time quality. There’s not much difference between a 1945 Terrytoon and and 1955. This can be seen as a failing on the studio’s behalf. The major lure of the 1950s old-school Terrytoons is the animation of Jim Tyer (speaking for myself). Seldom has such an eccentric creator been given so much “wiggle room.” This may have been cynical neglect, on the management’s part, but Tyer obviously relished the laboratory-playground that the studio was for him. As you say, there were talented animators and artists at Terry who were, arguably, kept from achieving their best work by the sheer status-quo that prevailed. Animators such as Carlo Vinci and Bill Tytla were also able to express themselves in their Terry work. I’m sure these films looked corny and dreary in the full bloom of the UPA style revolution. There’s a place in the animation world for both approaches, and both are valid. I think you breathed welcome life into the Terry studio. I wish you’d been able to stay longer, and wield more influence over the “suits.” I’m grateful for the cartoons you were able to create during your stay. The management were fools to overlook this chance to excel. C’est la vie. Gene, I hope you continue to share your thoughts with us on this blog. 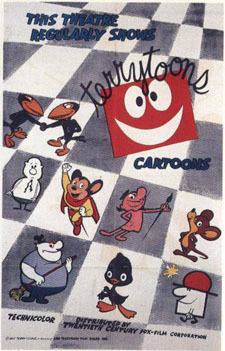 Terrytoons was a crap studio, for sure, but you can still pluck a few winners from the pile. I like Heckle and Jeckle as a toddler, but find them unwatchable now. Tom Terrific holds a very dear place in my heart, having grown up with the gentle Captain Kangaroo. If you would like to see what else I’m doing at 89, you can visit me and “Nudnik” on Facebook, where he is flogging his new Fantagraphics book and Rembrandt Films DVD, each with the same title, “Nudnik Revealed.” Nudnik also will soon be trying to make out on Twitter and Tumblr. Whew! I just saw the “Maurice Sendak 50 Years” exhibit at the Portland Maine Library and, while I was excited to see so many drawings of his, what thrilled me just as much was seeing an original cel from your production of “Where the Wild Things Are” for Weston Woods and the presence of that film playing on a continuous loop on a huge monitor. The work you did for Terrytoons is FAR better than anything that the studio had ever done. And Tom Terrific is still the greatest cartoon tv series ever made, in my opinion. I can’t believe it’s not available on DVD. Getting to meet the you in Prague a few years ago, the great writer and the great artist behind Tom Terrific and all those amazing Weston Woods masterpieces, was a tremendous honor. Thank you for doing everything with integrity. I’ve heard that Viacom thinks no one will buy black & white cartoons! How about that for brains? when i was a preschooler i was mesmerized by “tom terrific”. seeing tom transform was simply amazing to me, and manfred kept me in stitches. as a young man i was introduced to your work for “the record changer” in the pages of “weirdo”. my mind was officially blown … your hip sophisticated style was my first introduction to mid century modern, a style to which i will forever be addicted. years later i was given a more thorough introduction to you and your work through your online writings and through fantagraphic’s collections of your work. your work always leaves me wanting more. you are one of the most important animation artists ever. your strong drawing abilities, your unique style, and your engaging storytelling set standards … standards that though i will never reach i will always aspire towards. as a child i was enchanted by your tale of a funnel-hatted boy with amazing powers and his faithful dog. as a man i recently completed work on a tale of a pumpkin-hatted boy with amazing powers and his faithful cat. thank you, Gene Deitch, for all you have shared with us. also, thank you so much for recording and preserving the works of Connie Converse. she is incredibly talented, and has become one of my favorite recording artists. I never would have heard her work if it hadn’t been for you. I remember watching those bizarre Tom and Jerry cartoons that you did back in the early ’60s as a kid. (In case you’re wondering, I was born in 1985.) Now, after seeing your Nudnik cartoons for the first time; I have to say that those were hilarious. I loved Tom Terrific when I was young and remember wanting Mighty Manfred to be my dog! So disappointed when it went off the air and out of my life! Years later I was able to acquire a couple of episodes on video tape (this was long before YouTube) Your granddaughter, Casey, who worked at the comic book shop in San Francisco that I frequented, told me she had never seen Tom Terrific so I gave her my tapes. She said she liked them! Of course it’s possible to sample the series on YouTube now, but I’d sure love to be able to get the whole series on DVD. My head still spins at 78 rpm marveling at all the wonderful stuff you did for The Record Changer. It’s on AWN.com. And of course my latest passion, Nudnik, is on Facebook, and soon to be on Tumblr. Well look! I have to keep busy, don’t I? I’m also busy updating my AWN.com book. “How To Succeed in Animation. And if you’re not totally over-Deitched by then, there is my immense blog, at genedeitchcredits.com with its creepy-crawly Deitch Dungeon, where lurks the previously hidden dregs of my career! There are some downers in there, but the upside is, it’s all free!. Even in the depths of the D.Dungeon, you are never asked to buy anything. How else could I get you to read my grabbag of stuff? I did read your article at AWN, it’s great! Im young and Im just joining the party, but when I watched Munro back in animation school a couple of years ago I became a fan of yours instantly and Im still discovering your work through this site and AWN. Thank you, Master Dietch! Greetings from Guatemala! I remember one day in the distant past, the “The Terrytoon Show” started off with a Clint Clobber cartoon; it was my first exposure to the avant-garde work of Gene Deitch, and one of the traumatic events of my youth. Those Deitch terrytoons are not for kids! But, like most 7-year olds, I grew up, and tastes change. “Sick Sick Sidney” and “Topsy TV” are now among my favorites; innovative, brilliantly designed, and fast-moving. If only these and the rest of the Deitch ‘Terrys’ would come out on DVD or Blu-ray (Nudnick is not enough!) That said, I will remember Gene above all as the creator of “The Cat;” I’m sure most of you have, but anyone who hasn’t seen Gene’s work for “The Record Changer” doesn’t know the real Deitch. Mr. Deitch – Some of us fans prefer the old Terrytoons over some the more artistic accomplishments of Disney, MGM, or Warners. Yes, we know the boss was cheap – and yes, we know he ran it as a business, and stifled creativity. But artistically, some of these little cartoons soar, where other product gets bogged down in it’s own artistic ambitions. And make no mistake – we absolutely loved your own Terrytoons makeover in the 50s. I had to wade through a lot of mediocre Cpt. Kangaroo some mornings just to get to your terrific ‘toons! I stumbled across your blog earlier this year and have been reading it since. I was very recently watching a DVD of Weston Woods cartoons with my 6-year old who absolutely loves them, and I thought “waitaminnit, that says ‘Gene Deitch’!” So when I read the above, I thought I’d let you know that your work continues to make children happy and stimulates their li’l brains 🙂 We’ll be starting up the UPA ‘Jolly Frolics ‘collection next. Best regards ! PS: Have you been to the Karel Zeman Museum in Prague? I’ve explored their website and they have started releasing DVDs. who essentially used mechanical stage magic, enhanced with the possibilities of film splicing to create the concept of movie magic. Karel Zeman picked up the torch of Melies, and became the actual pioneer of movie magic as we know it today. The Karel Zeman museum in Prague is well worth the price of an air ticket. Don’t miss it! Tom Terrific and Manfred were and still are wonderful. Thank you so much.